An unauthorized entry into the Bungalows, Banks, and warehouses by breaking open the Shutter is the most common modus operandi noticed in the case of theft, loot, robbery, and riots. Till very recently we had no direct solution for this and we had to depend entirely on the security guard, as we all know due to its centralized nature & dependence on individuals such security systems has never been so effective, protection of Shops, Godown etc. has always been a point of great worry & pain for the owners but now you have hundred percent solution to this problem i.e. 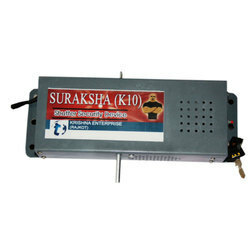 now you have "GOLDEN EYE SHUTTER SECURITY DEVICE" the only one of its own kind in India. "GOLDENEYE SHUTTER SECURITY DEVICE" is a typically designed tailor-made safety device for the total protection of unauthorized entry into your Shops, Godown etc. by breaking open the shutter, even by few inches. Here are some salient features of this tailor-made product "GOLDEN EYE SHUTTER SECURITY DEVICE". This System will be fitted by our trained technician. It is fitted inner side of your shutter in the bottom (where your center locks have been fitted). Yes, it will. “GOLDENEYE SHUTTER SECURITY DEVICE” is a typically tailor-made safety device. After a year of research and study of all types of Shutters available in the market, we have made this product. So that it can be fitted in all type and model of shutters available in the market. “GOLDENEYE SHUTTER SECURITY DEVICE SYSTEM” totally gives us freedom from all hassle of electric wiring. This system totally works on self-battery. So, you don’t need to worry whether there is an electric cut-off or if somebody intensely cuts your electric connection and also gives you total freedom from the yearly wiring maintenance cost. “GOLDENEYE SHUTTER SECURITY DEVICE SYSTEM” works totally on its self-battery (12 batteries of 1.5 volts) and its cost is an app about Rs. 75/-. Basically, its batteries work for 1 ½ yrs. approx but we always advise to change it every year for better performance. If once its siren signal used continuously for three to four hours, then you have to replace the batteries.